Believe it or not, I am not dead, though you may have thought so since I have been away from the keyboard for so long. The fact is……I am still alive and kicking, fat and happy. Hopefully, that is good news to you. If not, I am sorry you feel that way, but I am here for a few minutes and you can find something else to read if you like, though I don’t recommend it. Sure, if you mean things like illegal activities, things you have no interest in, or certain food preferences. I don’t like asparagus, brussel sprouts, or cottage (gag) cheese. I stay far away from them. I avoid drugs, robbing banks, polo matches, reading technical manuals, and gang activity, but that’s not what I mean. Obviously, you have never read any of my earlier posts, and are ignorant of the magical meat that comes from a can. I can forgive that and will direct you to this link for enlightenment. Please read it after you are through. No, what I see are too many people bored with their lives. They want to do something else but they are scared to try. I am talking about taking chances every now and then. Going out on a limb and trying things you have always wanted to try but have been scared to attempt. Not being so afraid that you play it safe all your life, dig into a boring routine, and never realize what you are capable of. “Ok that’s weird but keep going”. Some people live their lives wrapped up safely inside the cocoon of their controlled environments and are scared to step outside those boundaries, for fear of what will happen. For example, maybe their job is not enjoyable. They hate going to work and they are bored to death but it is secure and they need a paycheck, so they trudge along, hating every day of their life because they are SO BORED. I understand the need for financial security and agree that financial needs have to be taken care of. I admire that dedication, but why be stuck there if you are not happy doing what you are doing? Why not get trained to do something else and quit making those around you miserable? “How can you say that? I am not miserable. I just HATE my job”. HMMM. Don’t I frequently hear you telling others how awful your job is and how bored you are, and how terrible and stupid your boss is? We all know you hate your job and the fact that we all know it means that you don’t keep quiet about it, which brings down office morale and that negativity spreads like a virus. That tells me that you are not a positive, enjoyable employee who is contributing to the cause of the organization. Rather, you are a “pot stirrer”. You like to mix things up and see what you can get going and how many others will chime in to join the pity party and spewing of negative comments. It is not healthy and after a while, people begin to avoid you. Haven’t you noticed the way people roll their eyes when you start griping? A lack of passion for what you do and boredom or frustration with your current situation often translates into poor customer service. We have all encountered the person on the other side of the counter or other end of the phone call who obviously doesn’t care about what you need and are just waiting to get off at 5:00. Do we really need more of that? Why not try and change your situation? What would you enjoy doing? Not really what I was going for, but I can tell you have a passion for performing so let’s go with it. Let’s say you were still in your 20s, single, and have the proven talent to go for it. You are willing to pay the price by sharing a tiny apartment in NYC with other hopefuls, wait tables or do some other odd jobs while you audition and try for the big break, knowing that it is one of the most competitive, cutthroat businesses around and the percentages are against you. Why not try it? You will always wonder if you don’t try. However, you have to have a plan, be reasonable and honest with yourself, and know when the signals are telling you to change gears and try something more stable. In your particular case, you love to perform, but you are 45 with 2 kids in college and your family needs to survive more than you need to sing. You should not quit your job and try to break into show business because the “only thing you have ever wanted to do” is sing on Broadway. However, you are passionate about performing, so why not join a local chorus, church choir, or even a local music group. They advertise for singers all the time. There are community theater productions and church drama teams that are always in need of volunteers. That would give you something enjoyable to do that you can be passionate about outside of work and would give you something to look forward to. “Yeah that would be great. I have always been too scared to try that, but maybe I will. I still hate my job, though”. Well, in today’s economy, some job is better than no job, in most cases, but I would hope that everyone can find something they excel at and enjoy. If you really love what you do, it usually shows and you will do it well. I am so blessed that I LOVE what I get to do for a living and I am good at it. I think the two go hand in hand and I don’t believe loving what you do for a living is out of reach for others. I know people who have spent their entire life doing something they really didn’t enjoy doing because it is what they thought they were supposed to do, or what they were told they should do. They didn’t pursue what they should have done or wanted to do. I also know people who have gone back to school to become a teacher or nurse or get into another field that they find interesting and enjoyable. I know someone who was a geologist and when the economy caused a bad turn in the oil business, he had to do something else. He ended up being a railroad engineer for the next 25 years and loved it. With the the types of training and education that are available through online training programs and weekend or evening university programs, opportunities exist for people who don’t want or cannot go to traditional college programs. Financial aid packages are available, and if you are driven enough, you can even get an extra job to earn more money to save up for the training you need. “Well, sometimes I’m not motivated to work”. Sometimes we need a break because of burnout and sometimes we need something different to motivate us. A change of pace, different assignments, new job entirely. Lack of motivation comes from several things, which could include depression, but can also be due to boredom from the same old routine and lack of adequate challenge. It could also come from complacency, which usually comes from a lack of need to change things and a satisfaction with the status quo. For example, a consistent stream of income to support the current lifestyle without the need to work for it. If there is no need to change, nothing will change. So, until something motivates you to change your situation, it won’t change. Look at your situation and see what it is that is hindering your performance and then take steps to change it. I currently have two kids in college and we don’t know what lies in store for them financially, vocationally, or otherwise. It is a scary place out there in the job world these days. I want them to be able to earn a living and not be dependent on their parents for financial support for longer than necessary, for the obvious reasons. They are both tremendously talented, each in different areas. I hope they will find the careers that feed their souls and their passions and allow them to make the world a better place than they find it, regardless of what they elect to do with their lives. I want them to happy. I hope they will be willing to take chances to discover what is necessary for them to feel that passion and what will make them happy, for if they do, they will be great at their chosen vocation and that brings rewards of its own. 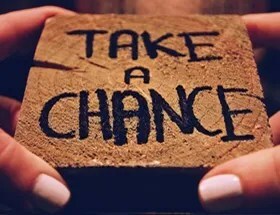 Why take chances? Because it is unlikely that the very first job they land will feature all the things that feed their passion. Without trying things on and seeing how they fit, they will not really know which things they like and which things they don’t. Notice I didn’t say I want them to “make a good living”. That is a relative term and varies according to your priorities. While I make a “good living” compared to many, I make a fraction of the salaries of many of the people I went to school with. I love what I do though and I am hopeful that my boys will have the same blessings as they go out into the world and try to make it a better place. Finally, speaking of taking chances and not being too scared to try things. After going through a divorce and learning how to be a bachelor again, I have been blessed to meet a wonderful woman with whom I mesh very well. To quote an older friend of mine whose second marriage has lasted 30 years, I am “jumping back into the fire” and will be getting married later this spring. I wondered if that would ever happen again and we were both pretty well convinced that marriage was not in the cards again for either of us. However, just goes to show you that with some faith and a willingness to take a chance, some wonderful things can happen, regardless of your circumstances. I hope you will allow yourselves the same freedom and try something new this year. Take dancing lessons, learn to cook, take that trip you have been dreaming about, explore new adventures, learn a new language. Maybe even fall in love. 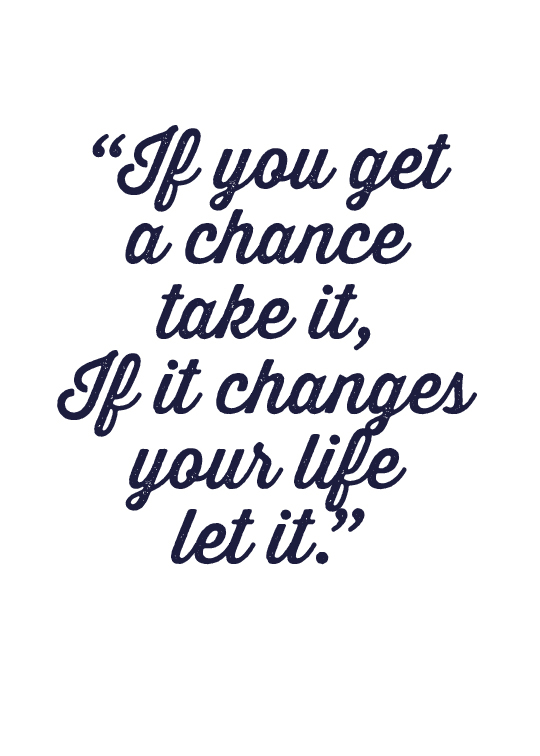 You never know what can happen unless you are willing to take a chance. This entry was posted in Inspirational / Motivational and tagged bags, Big Bags O Fun, chances, education, jobs, love, marriage, motivation, take a chance, trainig, work by Bagman. Bookmark the permalink.